At this year’s World Economic Forum in Davos, Switzerland, Indian Prime Minister Narendra Modi insightfully commented, “Today, data is a real wealth and it is being said that whoever acquires and controls the data will have hegemony in the future. The global flow of data is creating big opportunities.” Governments and businesses alike are increasingly dependent on data to help inform their operational and decisional processes. As a result, companies like Microsoft, Oracle, and Google are seeing an increased demand for their services. While firms like these should be lauded for how they’ve advanced the industry, crucial problems still exist, even despite their best efforts to solve them. Data management is overwhelmingly controlled by centralized authorities, which results in a lack of transparency and high costs. Most startling is the harsh reality that big data housed by centralized parties isn’t safe. Take for example Equifax, Facebook, and the US Securities and Exchange Commission. These organizations are but a very small sample of entities whose big data has been compromised, exposing hundreds of millions of people to unnecessary and preventable risks. Thankfully, companies are thinking critically about data in an attempt to use it responsibly. One blockchain startup, Fysical, is creating a decentralized platform for a transparent, efficient, and secure exchange of location data. Location data, a subset of big data, tracks human movements and is used by a plethora of parties to study human behavior and generate informed predictions. The Fysical platform will be built on a blockchain infrastructure, allowing it to provide the cost-effective transparency and security the location data industry desperately needs. In addition, the network will monetarily incentivize good behavior, which will provide data analytics firms with the purest location data possible. The Fysical platform operates using three major entities. First, there are the data suppliers. Data suppliers, be they applications, governments, businesses, or individual consumers, are responsible for collecting precise location data from users. In contrast to the traditional setup, however, data suppliers are fully in charge of their data. In fact, they are paid to submit their data, in contrast to other data agreements like those with Facebook, Google, etc. Data suppliers benefit from the transparency and auditability that Fysical’s underlying blockchain supplies–they know exactly where their data is going and how it’s being used. The second entity is the data buyer. Data buyers are enterprises like marketers, businesses, and hedge funds who utilize location data to make operational, sales, and investment decisions. They pay for access and decryption of the platform’s databases. Like data suppliers, data buyers benefit from the network’s increased transparency because they can validate the data path in the distributed supply chain. They can also audit data trails for data compliance and proof of origin. Finally, there is the Fysical market that connects data suppliers and data buyers. Location data is automatically published to the decentralized marketplace, where it is pruned, verified, and enriched by market service providers. Market service providers play a vital function on the platform because they are the network’s decentralized auditors. They provide the security that centralized third parties can, but without the cost and without the security risks. Each of the three parties mentioned above is financially incentivized by the platform’s token, FYS. Data suppliers are paid in FYS for submitting data, market service providers are compensated in FYS for maintaining the databases, and data buyers use FYS to make purchases and unlock data. Thus, on the platform, FYS tokens serve two primary functions. On the one hand, they have a core function–they are used to provide and access location data. Payments are based on the type of volume of data purchases. On the other hand, FYS tokens are used as rewards for data suppliers. Suppliers who provide clean, high-quality data are rewarded with FYS, as are service providers. 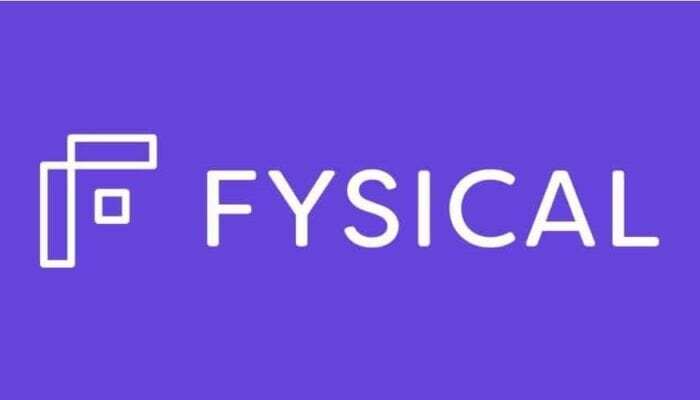 Lest this seem too ethereal–or too good to be true–the Fysical platform already has several use cases. 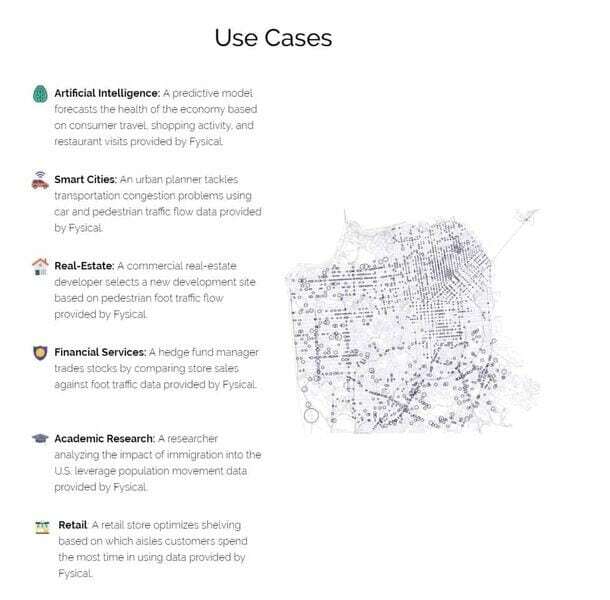 The location data platform can be used by governments and businesses alike to predict consumer patterns, optimize traffic flows, and even assist financial institutions in their investment decisions.